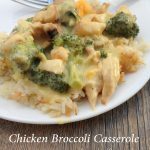 Chicken Broccoli Casserole is a weeknight favorite, loaded with lots of steamed broccoli, chicken and a creamy sauce all served on a bed of rice. We recently made a quick recipe video so you can see how easy this is to whip up. You’ll have to add it to your weekly meal plan, your family will love it! If a casserole can get my kids to eat broccoli, then I’m a fan! Here’s a quick look at the casserole right before going into the oven. I wish I could say that I follow this recipe exactly, but I’ve been making it for so many years, that things have changed here and there. We love LOTS of broccoli, lemon juice and curry powder and less chicken. Feel free to mix things up to how your family will like it. 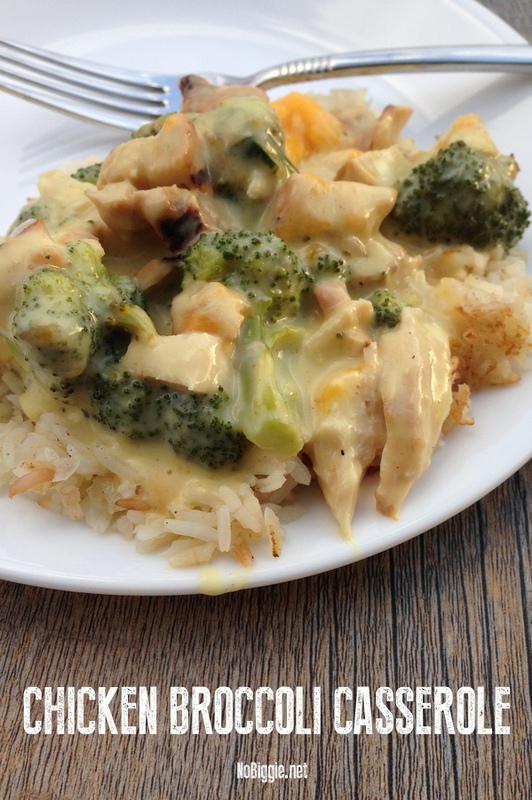 Chicken Broccoli Casserole is loaded with steamed broccoli, shredded chicken and covered in a creamy sauce all served over a bed of steamed rice. Cut, wash and steam the broccoli florets. Whisk together the cream of chicken, mayo, milk, lemon juice and curry powder together until well blended. Add the cooked shredded chicken to the cream of chicken mixture. Stir until the chicken is well coated with the sauce. 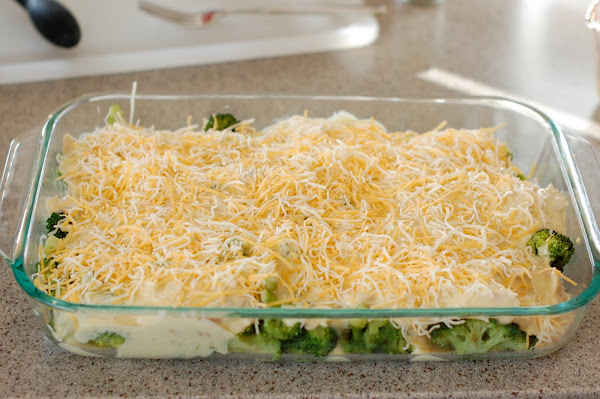 In a 9x13 glass baking dish, spread out a layer of the steamed broccoli florets. Spread the cream of chicken sauce mixture over the top the broccoli. We had your casserole and it was delicious! Thanks…Now I know what I'm making for dinner tonight. Broccoli dishes are always my favorite! My kids favorite! I got crazy one time and didn't steam the broccoli before hand and put it in the pan raw. And to my surprise, it turned out perfect! Not soggy or undercooked. Even easier! I've never used it with the rosteriee chicken but can't wait to try it! Thanks for the tips! I'm needing some new dinner ideas. Truely so sick of Chicken broc…we have it nearly once a week. Whenever a kiddo of mine is asked their favorite food the ALL reply Chicken broc! That looks good. Maybe even picky me would be tricked into eating the broccoli. This was so delicious!!! Thanks! We ate this once a week growing up. At least. I make this using french cut string beans and now will be trying broccoli!! Thanks for the Idea! Hi! This looks so good 🙂 what kind of cheese do you use? And any suggestions to sub the curry? Hi! I just use pre – grated cheddar. I’m not sure what you would sub the curry with. My Mama has been making a similar recipe for years. She tops it with mashed potatoes and another helping of cheese before baking. HAD EVERYTHING I NEEDED FOR THIS RECIPE AND COULDNT FIND CURRY AT ANY STORE. i WANTED IT BAD TOO ! What could be subbed for the can of soup? Do you just throw all ingredients together in dish? Layer the broccoli on bottom, then the mixture then top with cheese before baking. Accidentally used Chili powder instead of curry, but was still a hit. If done on purpose though, I’d only use 1 teaspoon of it. Will try again with curry and perhaps a bit of chili. Also, used cream of mushroom instead. @Lisa … get spices at your local Indian grocery. This recipe has long been a favourite in my home. But, we haven’t had it for a while… So guess what’s on the menu tonight?! Do you think Almond Milk will work in place of milk? Sure! As long as it’s unsweetened almond milk. and just where do you add the shredded chicken. for a new cook trying new recipes, this one would throw them for a look. you never mention in the actual recipe when, where or how to add the chicken. Yikes! Thank you for catching that. The recipe is now updated as to when the chicken is added in. Thank you. Looks delish! Could the mayo be left out or is there something that could be used in its place? Hi Danielle! Possibly, I think you would want to add the broccoli at the very end. Hello, this looks beyond tasty!! I am wanting to make this for my friend who recently just had a baby boy. Do you know if this heats up well? Or how long to reheat it for? Thank you! Hi Emily! So nice! I would bring it to her covered in tin foil with the oven temp and bake time written in sharpie on top. This way she can bake it when she’s ready! You can also have the rice steamed ready to go!